What a difference a few years can make, especially in real estate. In 2009, just eight short years ago, the market was flooded with homes for sale. There were lots of foreclosures as millions of people lost their homes in the wake of the financial crisis. At the same time, there were fewer buyers for those homes because a) it was harder to qualify for a mortgage and b) consumers were frightened by the market's collapse and reluctant to move. So the inventory of homes piled up and prices kept falling. Today, it's a very different story. Slowly, consumers re-entered the housing market as the economy improved. Investors snapped up those foreclosures, renovated them, and converted a large number of them to rental properties, since at the time, rents were rising and home prices weren't. Then, home prices began to go up as the number of first-time buyers increased and began competing for available homes. What should have happened, in a normal market, is an increase in inventory to meet the rising demand -- more new homes being built and more homeowners putting their houses on the market and moving up. But just the opposite happened. Home builders still aren't building as many homes and current homeowners are staying put. So now, people who want to buy a home and can qualify for a mortgage are having a hard time, simply because there aren't as many homes for sale. This weeks report from the government on new home sales underscores the point. Sales cratered in April, dropping 11.4%. The next bit of data in the report might explain why. 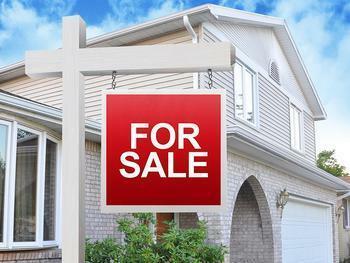 The median sales price of a new home in April was $309,000 -- and that was down from last year. The median sales price for an existing home in April was $244,800. In many areas of the country, both numbers could pose a challenge for first-time buyers, who have to save up for a down payment while paying ever-rising rents. Diana Olick, CNBC's real estate editor, writes that there are plenty of new homes now, just the wrong kind. Wrong, as in too expensive. Olick points out that while the supply of existing homes remains near historic lows, the supply of new homes just surged, returning to its recent average. But people aren't rushing in to buy them because many first-time buyers just can't afford them. So why don't builders put up subdivisions of cheaper new homes? Olick says they can't. Builders tell her land, labor, and materials costs have gone up since the financial crisis, making profit margins too thin to build many lower-priced starter homes. That suggests the real estate market's inventory shortage isn't getting resolved any time soon, and buyers may have to look longer and harder to find their dream home.